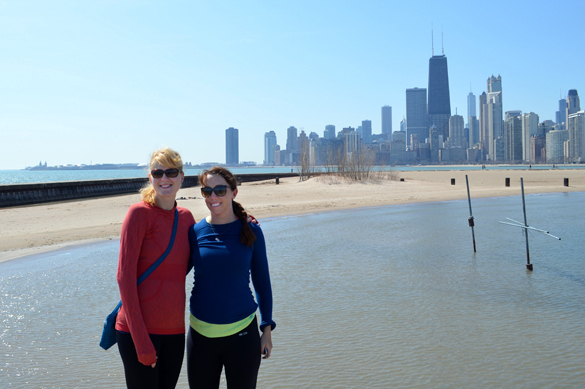 Taking in the great Lake Michigan & Chicago skyline. Before I went to Chicago, I had a serious case of stay-at-home mom burnout. And I truly didn't realize how bad it had become until I took that much needed time away. Over the last few weeks my patience had become threadbare and my fuse was almost nonexistent. I was quick to snap at Lee if something he said didn't sit well with me. I felt annoyance seep into my gut as Alice would whine and pull at my pant leg. And I found myself so easily irritated at even the littlest things. Of course I was never intentionally mean to Alice or to Lee but I just felt so empty inside. Like I'd lost the ability to see the joy in the every day. And I felt as if I had nothing left to give. Getting away from everything was exactly what I needed to recharge my mom battery. It didn't take long for me to feel those pangs of missing both Lee and Alice but I think I needed to feel those feelings in order to remember why I chose to put my career on hold to become a mother and a homemaker. Spending time alone and having time to reflect helped me realize just how good my life is here in Boston. And then, of course, being able to pee without Alice in audience or to sleep in till 8AM or to enjoy my coffee while it was still hot was pretty awesome, too. As I scooped Alice out of the crib that first morning after being apart for four days, I felt that overwhelming joy and sense of contentment I'd been missing for so many weeks. And as she snuggled into my arms and laid her head on my chest, there was no where else in the world I would've rather been. 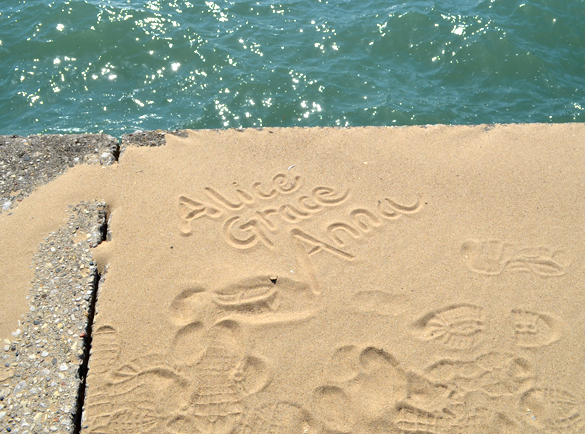 Writing names in the sand. // Cousins! // I'm tall. She's taller! I just wish I could be nearby to help tend Alice and give you two a break. I know it's hard, when your family lives hundreds of miles away. I'll have to get busy, get my schedule and come for a visit. Maybe you can let me watch Ms Alice for a weekend, while you and your hubby take a day or two off. Love you. You lucky girl! I am very jealous. I could realllly use a weekend away. I am so glad you got to do it. I totally understand the burnout feeling. I've been feeling that burnout lately too. And it is amazing what a weekend away will do to recharge! It's cliche to say, but it is so important that we don't lose ourselves as people, women, and friends once we become mamas. I am a better, happier, more fun mama when I am balanced. Glad you got away for a bit!